Most students walking about the university campus have no idea of what is going on below their feet, when passing the new building of the Heidelberg Ion-Beam Therapy Center (HIT). Below a grassy mound that is 7 metres high and nearly as wide as a football field, millions of electrically charged atomic nuclei are at large, targeting the tumours of cancer patients. The treatment is called ion beam therapy and benefits especially patients whose cancer resists other forms of treatment or is located in sensitive areas of the body such as the brain, neural pathways and the spine, where surgery is not possible. In addition to surgery and chemotherapy, radiation treatment of tumours is the third pillar of cancer therapy. The ion beam that is used to destroy cancer cells in this form of treatment consists of charged particles and not of electromagnetic waves as is the case with X-rays. Heidelberg is the worldwide only place where radiation is carried out using two forms of charged particles (ions). The subterranean facility can produce ion beams consisting of protons - positively charged nuclei of hydrogen atoms - and of heavy ions, that is, positively charged nuclei of atoms with a greater mass. When these particles hit cancer cells, they damage their DNA, which in the best case leads to killing off the neoplastic cells. Compared to X-ray irradiation, the ions discharge their destructive energy only, if they fall short of a certain speed when piercing through tissue. This is a huge advantage, because tissue that is pierced prior to undercutting that speed is hardly damaged and also the tissue behind the tumour remains largely free of radiation. The trick is therefore to control the particles' speed in such a way so as to make them hit the right spot within the tumour tissue where they then discharge their destructive energy. Currently, clinical studies research which tumours may be treated more successfully by X-ray irradiation and which might be more susceptible to ion-beam therapy. "We reckon that in future five to ten per cent of all cancer patients will profit from radiation therapy with ions or protons", says Jürgen Debus, Scientific and Medical Director of the HIT. Also, researchers at HIT investigate which kinds of particles, protons or heavy ions, are better suited for treating the various kinds of tumours. If a tumour is located at a particularly sensitive spot such as between the optical nerves of the eyes, or if it is very small, the ion beam needs to be aligned with great precision. This is when a gigantic blue, 670-metric ton steel colossus comes into play, which takes up three entire floors at the HIT with its 25 metres length and 13 metres in diameter: the gantry (pictured left). This is a special system that allows the physicians to steer the ion beam. Because the Heidelberg gantry can turn 360 degrees around its own axis, tumours can be targeted from every angle. This avoids the beam passing through particularly radiation-sensitive parts of the body on its way to the tumour. These include, for instance, bowel tissue, the brain and the spinal chord, which are particularly susceptible for radiation due to their cell characteristics and structure. 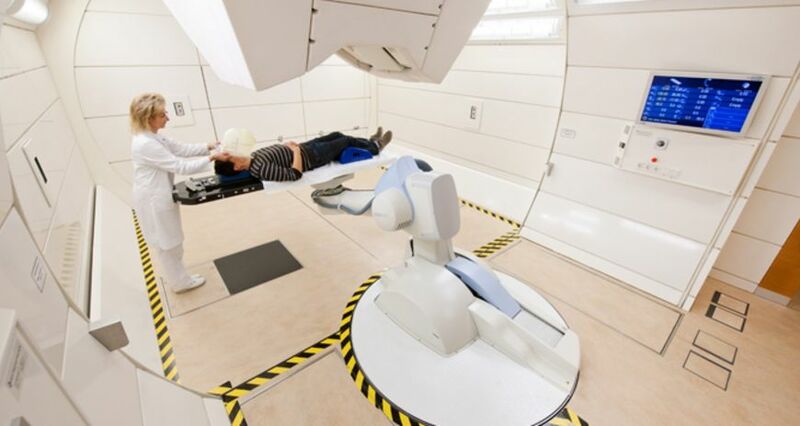 The HIT is the worldwide first heavy ion therapy facility with a gantry that can turn 360°. In addition to the Heidelberg University Hospital, its development involved three Helmholtz Association centres: the GSI Helmholtz Centre for Heavy Ion Research in Darmstadt, the German Cancer Research Centre in Heidelberg and the Helmholtz-Zentrum Dresden-Rossendorf (HZDR). The ions have to travel a fair distance until they reach the patient. This is one reason why the Heidelberg facility is so big. Furthermore, they are accelerated to insane speeds: nearly 200,000 kilometres per second, that is, about 75 per cent of the speed of light. This is the only way to charge them with the energy needed to destroy tumour cells. To make them this fast, a so-called synchrotron is required. This massive device consists of many very strong magnets, which make the ions race around in circles about a million times. Only then are they fast enough and can be sent forward to the patient. The Heidelberg University Hospital provides excellent graphic illustration of the ions' journey to the patient. On the HIT's website, viewers can take a 360 degree tour around the huge gantry or have a look around the gantry treatment room. Berlin-based scientist Ulrike Stein has discovered a gene that is responsible for the growth of tumours. Will this make cancer more predictable in the future?